In addition to taking our rides, you can take our two great children's books home and read about the farm. What a great way for your kids to remember their visit to the farm! Martha, the owner of Clark's Elioak Farm, is delighted to have written two children's books. 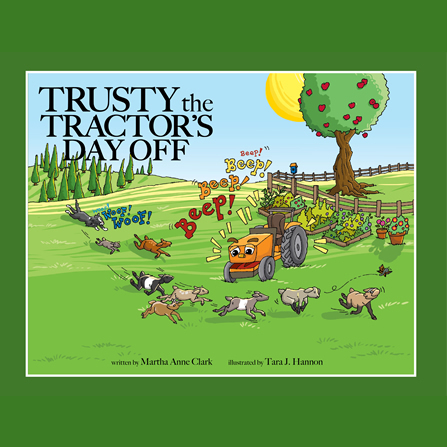 The first one, "Trusty the Tractor" was written in 2010. The book was conceived as Martha was driving the little tractor while baling hay in the summer of 2009. Trusty had left the petting farm for the day to help pull hay wagons full of hay to the barn. You could just feel that he loved doing new jobs on the farm. Martha wondered what would happen if he was given the chance to do the most important job on the farm, pulling the hay baler. Could he do it? Then she thought what a nice children's book that would make. ... In the winter of 2015, she was able to envision the next Trusty adventure as a fun book with Trusty worried about the exploits of Eli and his goat friends as they escape for the day and get into "trouble" on the farm. Thus, "Trusty the Tractor's Day Off" was born. In between the two Trusty books, Martha collaborated with Janet Kusterer to write a history of the Enchanted Forest, "The Enchanted Forest: Memories of Maryland's Storybook Park." Martha gets her interest in local history from a long line of family members who have made interesting contributions to our knowledge of this area. Her father, James Clark Jr. wrote a memoir, "Jim Clark: Soldier, Farmer, Legislator", which tells his story of growing up in Howard County, serving in World War II and the Maryland State Legislature, and his life-long passion for farming and love of the land. Her grandmother, Alda Hopkins Clark, wrote an entertaining account of her fox hunting experiences called "Hold Hard." Several generations earlier, her great-great-great grandmother, Martha Ellicott Tyson wrote several interesting histories, including a fascinating description of the visit of Little Turtle and several other Indian chiefs to her home in 1807 when she was twelve years old. She also wrote "A Sketch of the Life of Benjamin Banneker"(who was a friend of her father, George Ellicott), and a brief account of "The Settlement of Ellicott's Mills". We'll have to see what comes next!! 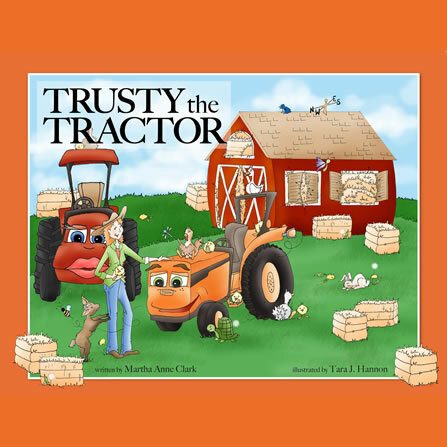 Tara has had the honor of bringing Trusty the Tractor to life in illustrated form. She is the illustrator and creator of Meant for a Moment Designs, and happily illustrates children's books from her home studio, in Crownsville, MD. 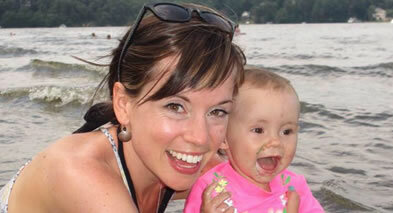 When not drawing, she enjoys her sweet daughter Lucy, jogging, and coffee. - sometimes all at once. Motherhood has blessed her with superhuman multitasking skills.